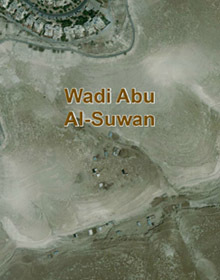 This residential area is located in the wadi southeast of Ma’ale Adumim . The history of the community is similar to that of other groups that lived in the area where the Ma’ale Adumim settlement was established. The community originated in the area of Tel Arad, from where it was deported following the War of 1948. 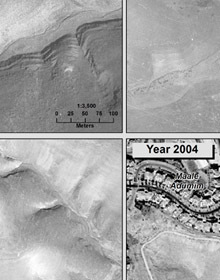 After living for some two years in the area of Masafer Yatta, near Hebron, residents moved north to the area between Jericho and Jerusalem, settling ultimately in the area that later became known as the “07” neighborhood of Ma’ale Adumim . As building in city expanded, the residents were evacuated repeatedly, until in 1999 they were moved to Al-Jabal. Some of the families that were transferred to the new locality still possessed large flocks that they could not maintain in Al-Jabal, and therefore they chose to split up. The women and children for the most part remained in Al-Jabal, for easy access to the school, while the men and the older women returned, with their flocks, to live in the residential areas still available outside of Al-Jabal, joining a number of families already living there. 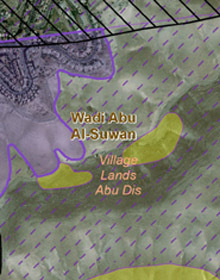 The locality is located on private lands owned by residents of Abu Dis, in a relatively open space that is convenient for grazing. The southern area of the locality is closed off under military order, and the planned course of the separation barrier also passes through it, for which purpose seizure orders were issued for the area in 2009. The locality is at the lower edges of foothills that descend from Ma’ale Adumim , on the edge of the planning limits of the city. – Closed military area that limits the grazing areas and access to water sources.